Remember – your website will serve as your online office open 24/7. What you want is to put up all the useful info you have about your brand, products, and services online, but you want those on a mobile-friendly site that people would prefer over a desktop site. So make sure your website is responsive – it should be able to display well on Android and iPhone, regardless of their size or whether a device is tilted to the side or right side up.Action Item: How Do I Know My Website Is Responsive? To do a quick check if your website is mobile-friendly, all you have to do is drag the edges of your browser (on a PC) and see if your site automatically resizes and changes layout as the window becomes narrower. Alternately, you can look at it through your mobile phone’s internet browser. Tilt the screen (make sure the screen rotation is enabled on your device), and see if it resizes nicely. Do so again with a tablet, tilting the screen so you can see how your site automatically changes layout horizontally or vertically according to how you’ve turned your device. Take note how it compares to what you see on your PC. If it doesn’t make auto adjustments, or if the layout doesn’t look so great, you may want to adjust your current design to make sure it looks great on mobile. Make sure your site loads in just under 2 seconds. Users hate slow-loading sites – they’ll just bounce out and go somewhere else. To test your site’s loading speed, head on over to Pingdom— it’s a free service that won’t only tell you how fast your site currently loads, but in the event that it does need some work in the speed department, it also has recommended action items for you to make your site faster. A secure site goes a long way towards establishing trust, so get an SSL certificate if you don’t have one yet. A secure site is now mandatory, especially if you collect personal information about your clients, or accept online payments. On the Chrome browser, users are told if they are visiting a site that’s “not secure”, meaning the site is not up to current security standards. You can tell because secure sites are now affixed with an “https://” rather than an “http://”. Can your customers easily find what they’re looking for? Make sure your mobile site is easy to navigate. Employing large enough fonts and easy-to-use navigation buttons will be of great help as well. Even your articles have to be a bit more organized: use paragraphs to break big blocks of text, and subheaders to define sections and topics within a page. Highlight key takeaways in bold text, and add links to other pages within your site. Local SEO is a great way for your business to be discovered by more customers from your neighbourhood. Whether your brand is an online business or a brick-and-mortar establishment, Google has a different set of SEO guidelines in place so that people nearby can find you more easily. If you haven’t yet, sign up for Google My Business (it’s a free service by Google) and fill up as much of the info as you are able to. This helps you get found better on the Google Local Pack when users search for establishments like yours nearby. Get yourself listed in as many local business directories as you are able. Remember to have the same NAP information (name, address, and phone number) on any site online. Don’t forget to include a link back to your website. It’s fine to ask for reviews from clients who have already tried your products and services. Especially if they’ve enjoyed them, you can ask them to leave you a nice review on Google or on your Facebook page. Set up two or three key social media channels. Find out what channels your target audience use, and set up pages with the intent of being helpful and informative. Social media is meant to encourage a conversation with them, and this gives you opportunities to win over some hearts and minds. YouTube is a great option because it acts like a second search engine, and video is the way to go for 2019. Instagram and Twitter are good social networks for your brand to be on as well. Read: “Which social media platform is best for your business” from TheNextWeb. Next step is to plot out a good posting calendar and stick to it. Use a variety of content and calls-to-action, including promotions, seasonal offers, and rave product reviews. Use plenty of good quality photos because you’ll get better responses that way. Whenever possible, post a series of short and sweet videos that are relevant, informative, and entertaining to your market. Last but not least, respond to comments and likes. Whether you get good or bad feedback, your customers are having a conversation with you, so on top of being nice, stay diplomatic, genuine, and above all, helpful. Don’t go for just any content; go for great content – stuff that your target audience really cares about. Photos and videos are among some of the best kinds of content you can come up with for your brand, as long as you have a good story. Even if your site is primarily just a catalog of a whole bunch of products, you could share tips, stories, and client reviews for starters. A blog is a good way to showcase your expertise and authority within the industry niche with fresh content that search engines love. Speaking of reviews, stellar customer service, coupled with even one or two standout products, goes a long way towards giving you good word-of-mouth. This, in turn, could lead to the much-needed positive online reviews for you and your brand. Start with a compelling offer such as free book or guide, a monthly newsletter with special promotions and packages, or some other market-relevant item. Use an email marketing service like MailChimp, Constant Contact, Drip, AWeber, or SendInBlue to help you manage and monitor your email campaigns. These services can also help you segment your mailing list so that you can better personalize email offers for best results. Create and then follow up via a series of thoughtfully designed emails. This could convert leads into paying customers. 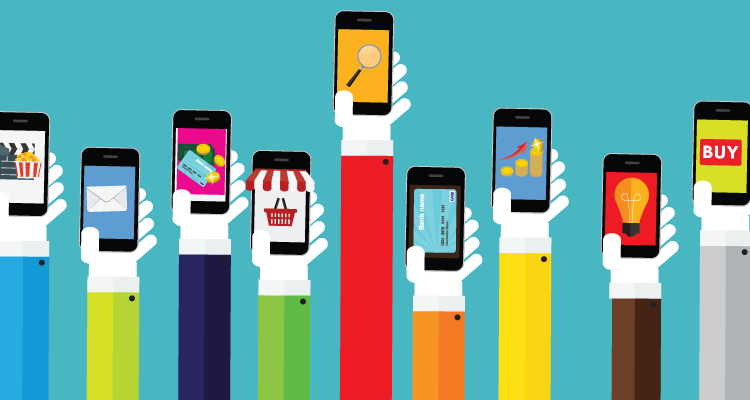 Take your mobile marketing campaigns a notch further by having your own branded mobile app. What exactly your app does is up to you, but its purpose (at the very least) should be generating new leads and attracting more buying customers, or encouraging more repeat business. Mobile apps are a great way to host a loyalty program, along with even more additional exclusive content. More importantly, they are the place to do creative upselling, announce special promotions or seasonal offers, and collect valuable data and insights from the customers. One of the more practical applications of artificial intelligence and machine learning for mobile marketing comes in the form of chatbots. Tied directly to key social media accounts like Facebook, a chatbot acts as a virtual concierge – collecting basic client information and addressing some of the brand’s most frequently asked questions as a way to automate some aspects of customer service. Chatbots are just the beginning. They’re actually pretty useful and nice to have at this moment, but you can imagine how much sophisticated they’ll become in the years to come. Some of the top-rated chatbot services you might want to check out include LivePerson, LiveChat, and Botique. Mobile phones are the new battlefield when it comes to winning over new customers for your brand: everyone’s on a smartphone, and everybody loves it. Embracing a mobile-first approach to your own marketing efforts is the only way to go for 2019. Unlike much of traditional marketing, mobile marketing is not only cost-efficient, it’s also fairly easy to implement, measurable, and best of all, highly effective when done right. If you’re a business owner, consider dedicating more time and resources getting your mobile marketing on track this year. Hopefully, with these tips, you can get a leg up on your competition and bring in tons of new business (as well as business opportunities) this 2019.